A great single sided or double sided printer with a 3 Year Warranty! Free cardPresso XXS version software included! The card feeder and output tray are directly accessible on the front of the printer, so you can check the cards as they come out. With the Evolis Premium Suite ® software you can receive notifi cations and easily control the printer from your computer. 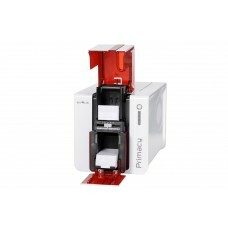 Evolis High Trust ® ribbons are easy to install and automatically recognized by the printer. The large capacity card feeder and output tray hold 100 cards - so you don’t have to refill the printer as often. Primacy offers high capacity in a compact footprint. Primacy benefi ts from Evolis’ experience and proven quality control to ensure optimum performance and perfect results. We back up our strong commitment to quality with our 3-year standard warranty.